Having previously written about My Christmas Traditions – things that I remember from my childhood, that I continue to do today, plus new traditions that my husband and I have started ourselves with our children. I thought I’d follow up by writing about where to visit at Christmas. December/Christmas, especially with Children, is such a magical time of the year. It’s definitely the time of year that can easily turn any hard faced adult into a Christmas jumper donning, pig in blanket eating, present ripping open excited child. Plus, you just can’t beat heading to activities and events with friends and family and sharing the spirit and love. 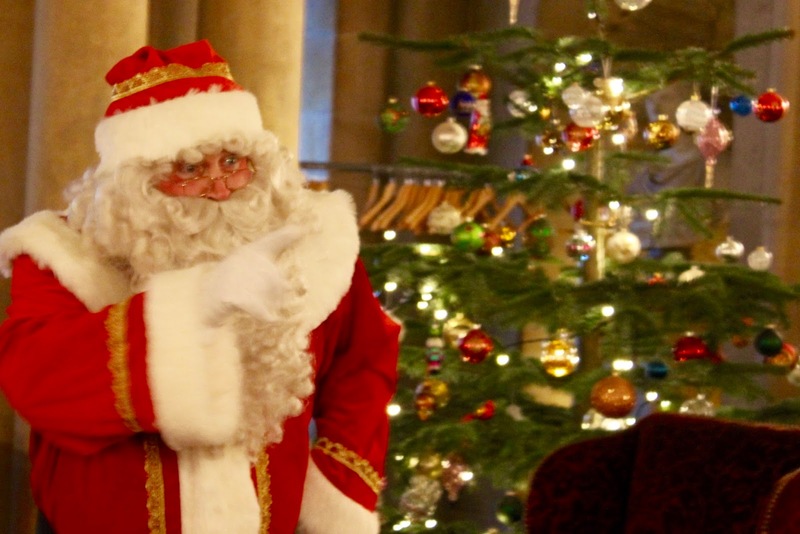 An Audience With Father Christmas, Castle Howard. Having previously written about this event here, I’ll keep this brief. A firm favourite and something even my husband looks forward to each year. With tickets going on sale in September… Yes, September, you are more than forced into a Christmas countdown from this point! Haha! Castle Howard really encapsulates the Chrismas spirit. The house and ground are always beautifully decorated. The amount of time and effort that must go into it is crazy. They have the biggest Christmas tree in the house, which, is totally Instagrammable (just saying! ), but to think of how many lights/baubles are on it… Wow! When booking, I try and find a late afternoon time slot, as the driveway to the house is always lit up and I feel it just adds to the magic. Now, note that at booking, you are purely booking and paying for your child’s visit. Once arriving on the day of the event, you (the adults), are required to pay the normal admission charges to enter the estate, as the event is held in a room within the house. The event itself the children are seated together, in rows. Father Christmas’s favourite wizard welcomes everyone, putting on a little magic show, telling a few stories and jokes. Then Father Christmas arrives, who is about as real life as I personally think you can get! After more stories and songs, he individually calls up each child to receive their gift. This is a great photo opportunity! After another sing-song Father Christmas then wishes you a Happy Christmas and takes up his chair near the fire. Queuing, you then have the opportunity for children to sit on his knee/stand next to him and have a photo taken. Get yourself signed up to their newsletter ready for next year. Yorkshire’s Winter Wonderland is an award-winning attraction, featuring on many ‘Where to visit at Christmas’ lists and quite rightly. It’s home for nearly two months, taking over a good percentage of the car park, is at the York Designer Outlet. The main draw of the wonderland is The Ice Factor. An outdoor ice rink. Which has a 30ft Christmas tree in the centre. When we visited, it was initially just for the ice skating. However, you can’t help but we swept up into the festive spirit and we spent a good half a day there. Ice skating, playing on the funfair rides, seeing Santa in his log cabin. I’d definitely advise pre-booking your skating. In the run-up to opening, for a period of time, they do have an early-bird booking at a discounted price, so keep your eyes open and on their socials for that. But bear in mind, if like us, you need a penguin for your child, these are on a first come first served basis on the day. Visiting Santa was nice. I’d maybe debate on what it was worth cost wise. I wouldn’t have said there was anything unique about it. It was nice that it was a one on one visit and that the elves took the pictures for you. After seeing Santa, you then had the option to purchase your photo or there were other options and bundles available including such things as magnets and postcards. I would definitely recommend visiting if you’re close by. Although busier, late afternoon/evening would definitely be magical seeing everything lit up. Also, enjoy a mulled wine in the licensed Papa Hutte cafe. Seeing Santa Come In On His Boat, Scarborough. It’s crazy, but it’s true. We are a seaside town, so obviously Santa arrives on a boat. I mean, have you ever travelled down the A64 to Scarborough? Mental! In all realness, Santa does arrive into town on his boat. from the harbour, being met with his helpers and sleigh, he then travels up through the town to take his place in Boyes, where you can visit him. This generally happens on a Saturday around the middle of November. The event is normally hosted by local radio station Yorkshire Coast Radio, who put on quite a show at the harbour, with local singers belting out Christmas tunes, to their mascot bear walking around handing out flyers, sweets, and balloons. Santa’s arrival is also broadcast live on the station. Personally, we make quite a morning of it, either grabbing a festive hot drink from Costa and walking down to the harbour, or warming up with a drink in a cafe on the foreshore, before securing a good viewing spot. Then doing what any seaside visitor would do on the foreshore.. We spend an obscene amount of money on the arcades. Sleigh Ride To Santa, Piglets Adventure Park, York. When asked where to visit at Christmas, Piglets Adventure Farm is always somewhere I mention. It is by far the best all year round attraction that I know of in our area of North Yorkshire. You pay an entry fee and that’s it. No more hidden charges. Whenever we visit we’ve always spent a good four hours there. The children just don’t get bored! Their seasonal events are fantastic. However, their Christmas one tops them all. I know it’s easy to use the word magical for everything, but it truly is just that. I think the woodland setting and their own spin and ideas really make it. Booking goes live late September/October for this seasonal event, but with so many time slots available – weekdays and weekends, it doesn’t book up as quickly as the likes of Castle Howard. However, the concept is similar in that it’s not a one on one experience, your time slot booked is for another five/six children also. But unlike Castle Howard, at the time of booking you’re booking for everyone in your party. Children and adults. On the day you’re asked to arrive 20mins prior to your leaving time. However, with younger children, this is easier said than done, especially when they’re excited, even the colouring area and write letters to Santa doesn’t distract for too long, so, 10-15mins is about right I’d say. Once your sleigh arrives at Elf Airlines, you’ll see the children’s names appear on the departure board, you hop onboard. Taken to the woodland village, you’re greeted by Mrs.Claus and taken to Santa’s grotto. Once inside – adults too, Santa has a good chat with you all and you sing a Christmas song. Each child is then given a special key. 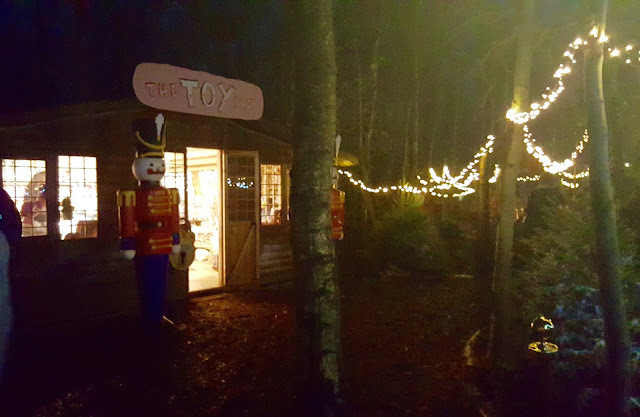 This special key unlocks Santa’s toy shop. Mrs.Claus then takes you across to Santa’s toy shop, met by an Elf, each child posts their key through the keyhole and is granted permission to enter. Inside the children can choose their very own gift. I honestly think this is one of the best parts of this event. However, cue children running around like maniacs trying to decide what they want! A few steps onwards and you reach Santa’s teepee. Inside is a warm log fire and seating, where you can sit and warm up. There’s also a mini drinks stall, as well as a reindeer food making station. From here, you’re free to jump on any returning sleigh you wish, you’re not set to a time, which is great. As you can expect, being set in a woodland, it’s an activity that’s best done late afternoon, so you get a feel for it and appreciate the surroundings and decorations. So there are four places to visit at Christmas in North Yorkshire. What are you waiting for? Get booked in ya filthy animal!